"We have to tolerate the inequality as a way to achieve greater prosperity and opportunity for all," says Brian Griffiths, Goldman Sachs International Economic Adviser. But when does the inequality end? 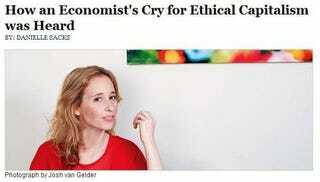 Noreena Hertz, rogue economist and capitalist reformer, says now. Few academics have leaped from the critical fringes to the role of prophet as adroitly as Hertz. Wielding her contrarian message — that markets need to serve the interests of people as much as they serve companies or shareholders — Hertz has been campaigning for the past decade against the mantras of mainstream economists, urging a more ethical form of capitalism. But her message isn't some yoga-infused spiritual quest. As she explained in her 2001 European best seller, The Silent Takeover, it is about the unsustainability — environmentally, socially, and economically — of laissez-faire capitalism and the idea that markets are stable. If the surge of corporate power was going to leave governments relatively impotent, Hertz argued, then those corporations themselves needed to fill the void. "She moved the conversation from what corporations can do to be socially responsible to a much more profound examination of the boundaries of corporate behavior and public behavior and where they have failed," says Debora Spar, who was a dean at Harvard Business School for nearly two decades and is now president of Barnard. "She's much more radical." Hertz — part activist, part detective — argues that both economics and business need to be put back into the human social context. "Over the past 30 years, economics became a narrow field completely out of touch with reality," says Hertz, 41, who sees the discipline as a jigsaw puzzle. "I don't believe you can reduce the world to a mathematical formula. I start with the world, assume it's complicated, and ask where can I get help from a whole range of disciplines." Drawing on subjects as diverse as anthropology, physics, geopolitics, and neurology, Hertz's economic vision is at once eclectic and holistic, which may explain her apparent ability to foresee dangers and opportunities others do not. It is also relentlessly pointed, serving an explicit agenda — making corporations realize that they can no longer operate in their Adam Smith — designed bubble. "I really believe in a globalist agenda, but globalization isn't just allowing companies to trade freely all over the world. It's about what types of rights and responsibilities come with that," Hertz says. With inequality surging, resources diminishing rapidly, and the earth's very future in question, capitalism-at-all-costs is no longer an option, she insists: "I have problems with this very extreme form of capitalism where the pendulum has swung so far in one direction, where the focus is completely on the short term, and no one is thinking about the consequences." Hertz has since devoted her career to debunking economic myths. After a year, she quit her World Bank job and spent another four years in Russia while getting her PhD in economics and business at Cambridge. Hertz published a book indicting the World Bank and the IMF for imposing American-style capitalism on Russia without contemplating the social cost. "It was never about being anti-capitalist," she says. "I realized that how an economy functions is not just about a market anonymously distributing things but also the way people relate to each other, their beliefs, the way power is distributed. All of that was being ignored." She points out that life expectancy in Russia has fallen by 15 years since the early '90s. Says punk fashion designer Vivienne Westwood, a fan of Hertz's work: "Noreena looks at economics from the other side. From the people it suppresses. This is what punk is all about." The punk economist spent years honing her ideas, railing against "Gucci Capitalism" since the 1990s. The premise of her work is simple: our systems are broken, and social equality will pay a major role in forming this new economy. Hertz says that even though many necessary shifts — like caps on banker pay — haven't happened yet, there are already indications that challenges to laissez-faire capitalism are taking shape. Anglo-American market dominance, she says, will be contested by emerging economies like those of Brazil, China, and India, whose votes are likely to be given greater weight by the World Bank and the IMF. At the same time, some countries are starting to question the notion that mere GDP defines success. France, based on recommendations from Nobel Prize economists Joseph Stiglitz and Amartya Sen, recently announced it would de-emphasize GDP in favor of other factors such as quality of life and the environment. (Hertz points out that a country's "health" most often correlates with its levels of inequality, now at an all-time high in the United States.) To shake up the old boys' networks, countries such as Norway and Spain have passed legislation that will require company boards to have 40% women. Hertz, too, is helping to drive these developments: She's working with banks like ING to unite investors, environmental NGOs, and other groups in a dialogue about the thorniest global problems. Even if we can overcome the immediate crises we face, we will still be left with fundamental questions about the effectiveness of capitalism in tackling such unresolved problems as persistent poverty, lack of access to health care and education, and epidemic diseases. In my view, the theoretical framework of capitalism that is widely accepted today is a half-built structure-one that prevents Adam Smith's "invisible hand" from operating as he believed it should, transforming the pursuit of individual gain into general social benefit through the workings of the marketplace. In a sense, we have chosen to disregard half of Smith's message. His landmark book, The Wealth of Nations, has drawn all the attention, while his equally important Theory of Moral Sentiments has been largely ignored. The present theory of capitalism holds that the marketplace is uniquely for those who are interested in profit only. This interpretation treats people as one-dimensional beings; but people are multi-dimensional, as Adam Smith saw so clearly two and a half centuries back. While we have a selfish dimension, we also have a selfless dimension. The prevailing theory of capitalism, and the marketplace that has grown up around the theory, makes no room for the selfless dimension of people. If the altruistic motivation that exists in people could be brought into the business world, there would be few problems we could not solve. The financial system has broken down because of a fundamental distortion of its basic purpose. Credit markets were originally created to serve human needs-to provide business people with capital to start or expand companies. In return for these services, bankers and other lenders earned a reasonable profit. Everyone benefited. In recent years, however, the credit markets have been distorted by a relative handful of individuals and companies with a different goal in mind- to earn unrealistically high rates of return through clever feats of financial engineering. They repackaged mortgages and other loans into sophisticated instruments whose risk levels and other characteristics were hidden or disguised. Then they sold and resold these instruments, earning a slice of profit on every transaction. All the while, investors eagerly bid up the prices, scrambling for unsustainable growth and gambling that the underlying weakness of the system would never come to light. Let's be clear here. What we are currently practicing isn't capitalism. It's a perversion of the original system, designed within a rigged system, set to benefit a few. And innovators like Yunus and Hertz are primed to lead us into a brave new market - or they would, if we were willing to listen.